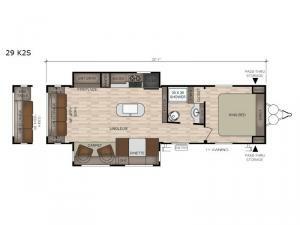 If you are looking for a unit that is both classy and comfortable, then you must take a look at this Della Terra travel trailer. This spacious unit gives you room to eat, sleep, and play because of two opposing slides that have been included in the living area, and the kitchen island adds extra counter space in the kitchen so that dinner preparations are a breeze each evening. After dinner, you can gather everyone together for a round of cards in the rear living area while you listen to the faint crackles coming from the fireplace.